In a world that’s ever more connected and where consumers have plenty of choices, you need more than just marketing campaigns to attract people’s attention. Not only that; you also need to capitalize on that attention, you should make it count. We’ve all been there. You’ve spent a lot of time and resources on crafting an innovative and agile marketing campaign. You have set aside a budget for marketing every month. Your marketing team is doings its best to meet the expectations, but there’s still something missing. The results are not what you expected, despite the sheer efforts on part of your marketing team. Sometimes, you need more than just an innovative marketing campaign; you need a clear strategy, you need the right tools to make the best out of it. It goes without saying that marketing is a crucial part of the company-to-customer(or prospect) relationship. Companies spend a lot of time, money and other resources on building solid marketing campaigns, hoping that people will not only turn their attention to what they have to say, but also spread the message. This might easily work when you’re still small. At this point, building and maintaining one-on-one relationships with prospects and customers is fairly easy. As your company grows, however, maintaining these close relationship with your customers becomes a lot harder. You can’t simply manage every marketing-related task through Excel spreadsheets, or by simply hiring a marketing specialist. No one knows your company better than you, no one cares about your company as much as you do. All you need in building a solid marketing strategy is the right mindset, and the right tools to carry out that strategy. You might be wondering: “This is fine and all, but how do I know if our strategy is the right one? What tool do I need to use in order to make the most of our marketing campaigns?” While there’s no magic formula to how building a winning marketing strategy, you can gauge its success by asking questions like “Are we really helping in making peoples’ lives better? Do our customers share our core values? Are they fully engaged with our product/service? Do they fully embrace our message?” Such questions help you get an idea of where you stand, but if you want to get concrete results, you need more than just asking questions. You need to actually track and measure the performance of your marketing campaigns. That’s where marketing automation comes into play. Marketing automation, as the name itself suggests, is a set of tools that helps companies automate marketing processes such about customer segmentation, campaign management and customer data integration. Used the right way, it can yield great results. Have you ever wondered why so many companies with enough budget dedicated to marketing, enough resources and the right strategy, fail to achieve their goals? It’s not just about having the right strategy, the budget and the necessary resources to make it big; you also need the right tools. Sending massive emails without ever tracking their open and click-through rate, or other important metrics, is like shooting in the dark: sometimes you might hit the target, but will miss it most of the time. Fortunately, Flexie CRM has got your back. Instead of sending countless emails that might end up in the trash, you can send massive emails that can actually be tracked and tweaked all the way through. Sending dynamic content is one of the best ways of engaging prospects and customers alike. Doing that manually over and over again, however, would take you a lot of time. 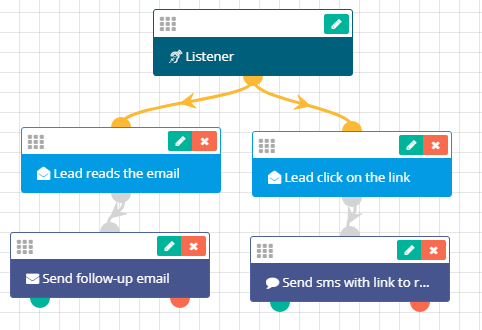 In Flexie CRM, you can easily send mass emails to your leads, contacts, etc. Sending a lot of emails to different recipients is just the first step. You need to track and measure their performance. How many did open the email? If so, did they click on a specific link inside the email? Did they subscribe to your newsletter? Or did they unsubscribe from receiving your emails? Unless you track the emails you send, you have no way of knowing. The real power comes from knowing everything that has do to with your email marketing campaigns, and that’s where Flexie CRM comes into play. The process is completely automatic. The amount of time you save by building a workflow to automate your marketing campaigns is incredible. In addition to sending automatic follow-up emails, you can add a more personal touch to your campaigns by sending sms text messages. Your marketing strategy should always include marketing automation. Marketing automation is a first class citizen within Flexie CRM platform. You might have a fixed budget for branding, social media and other forms of marketing, but that’s not enough. The real marketing, the marketing which converts leads into sales, is always marketing automation. Not only will you automate marketing related processes, but you will also boost sales, increase productivity and efficiency, as well as deliver a great customer service. Ready to take your marketing to another level?